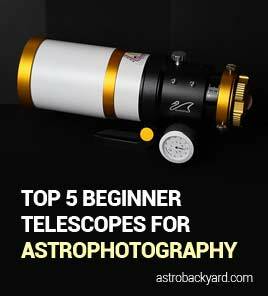 On this page, I will discuss the differences between the HEQ5 vs. NEQ6 astrophotography mounts from Sky-Watcher. 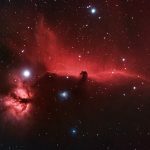 I am often asked by beginner astrophotographers for advice on purchasing their first tracking mount. 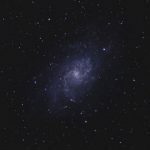 I have used a Sky-Watcher HEQ5 Pro GoTo for my personal astrophotography for many years in the backyard. It is a computerized “GoTo” telescope mount that can used for long exposure deep sky astrophotography. 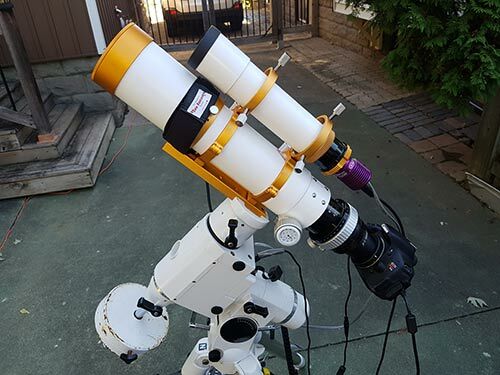 A Sky-Watcher HEQ5 Pro SynScan Computerized Mount with a William Optics Z73 riding on top. The Sky-Watcher HEQ5 has provided me with reliable and consistent results for my deep sky astrophotography endeavors, and I still continue to use this mount today. 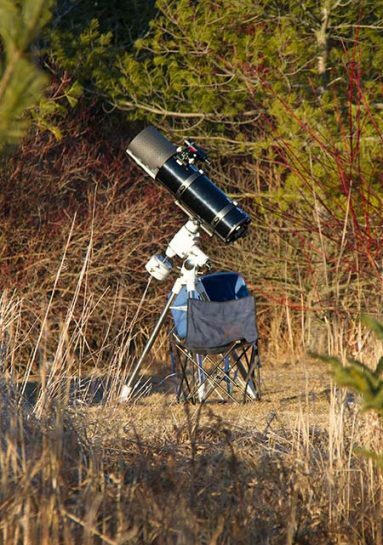 It is lightweight enough to quickly setup in the yard, and has a commendable payload capacity for a variety of telescope configurations. 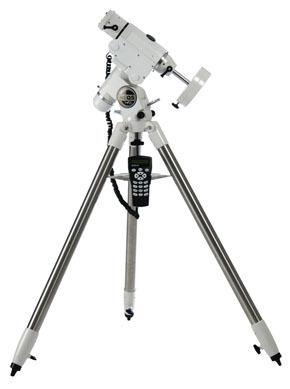 The Sky-Watcher HEQ5 Pro SynScan with an 8″ Newtonian Astrograph mounted to it. 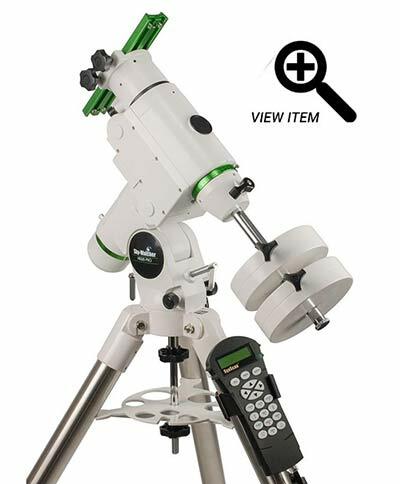 I’ll also compare this mount to the features offered by similar GoTo telescope mounts at this price point, including the Celestron AVX. The HEQ5 has been updated in many ways since the original version I purchased in 2014. For clarity, I upgraded to an iOptron CEM60 Center-Balanced Equatorial Mount in late 2017, and then a Sky-Watcher EQ6-R Pro in September 2018. A discussion that often surfaces is whether to invest in the Sky-Watcher HEQ5 Pro SynScan or the larger NEQ6. To be clear, I am referring to the HEQ5 Pro SynScan version, not the regular HEQ5 mount. You can often find this mount for sale in astrophotography classified sites such as Canada-wide Astronomy Buy Sell. My first experience with Sky-Watcher equatorial mounts was back in 2011. I had the opportunity to use my astronomy clubs Sky-Watcher NEQ6 with my brand new Explore Scientific ED80. I immediately noticed a big improvement from the Celestron ASCG-5 I currently owned. I would later purchase the HEQ5 based on the positive experience I had with the NEQ6. 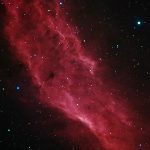 In October 2018, I upgraded to the latest version of Sky-Watcher’s EQ6 equatorial mount, the EQ6-R Pro. 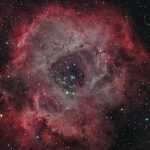 Have a look at my results using this mount early on, including autoguiding accuracy here: Sky-Watcher EQ6-R – First Impressions (Video). The SynScan system provides a user-friendly menu that allows automatic slewing to over 42,000 objects. The SynScan hand controller also has the ability to connect to your laptop computer with a RS-232 cable. This way, you can control the mount using a software from your computer, including a planetarium. 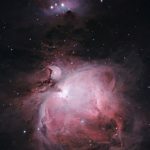 I am currently looking into controlling my Sky-Watcher HEQ5 using EQMOD during my astrophotography sessions in the backyard. EQMOD is a very popular way of controlling the Sky-Watcher HEQ5, NEQ6 and other mounts directly from a PC. 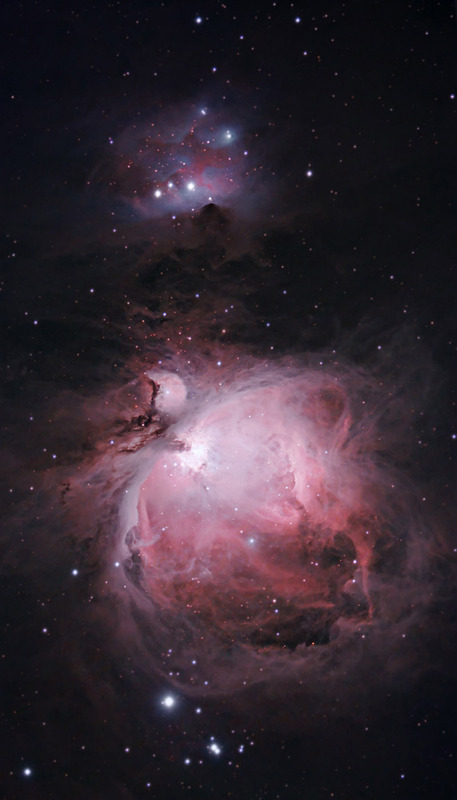 It allows users to use a planetarium and sky chart applications such as Cartes du Ciel to control and align the telescope mount. 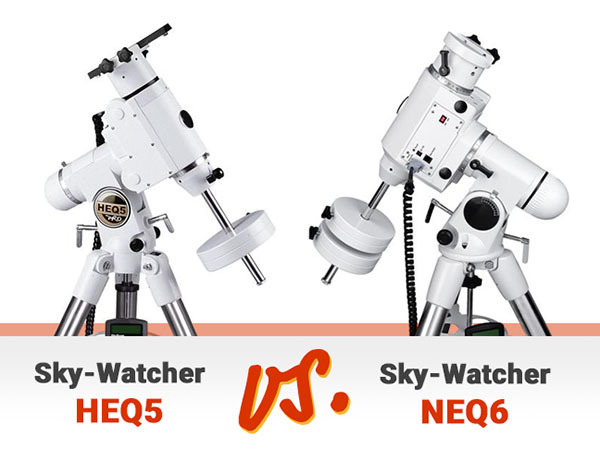 The EQ5 and EQ6 mounts from Sky-Watcher share many of the same characteristics. The counter weights, motor drive, GoTo hand controller, guiding and slew speeds are all identical. These two mounts both include a polar alignment scope, an extremely useful tool. 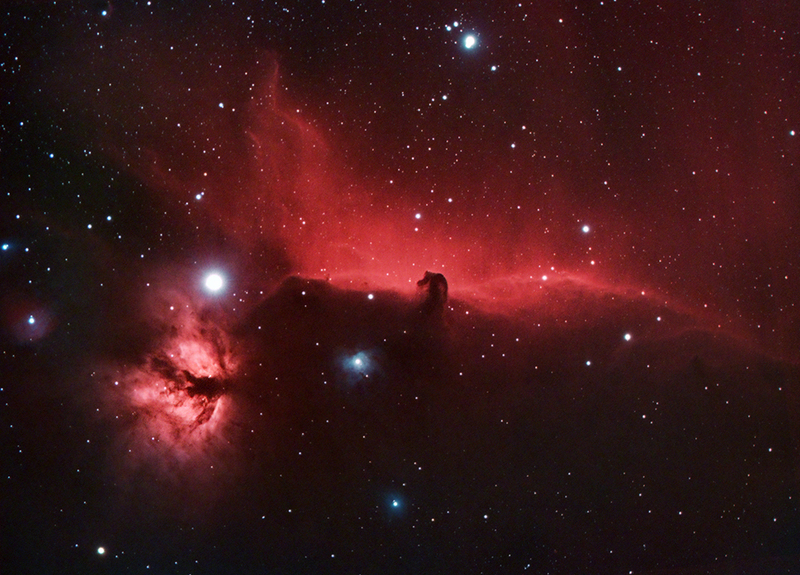 The biggest advantage the NEQ6 has over the HEQ5 is the ability to handle larger telescopes, and more astrophotography gear. The HEQ5 is a perfect fit with my small carbon-fiber refractor, with all of the necessary imaging gear. However, using my larger 8″ Newtonian Astrograph is about a heavy a load I would recommend for this mount. Owners of larger refractors or heavier reflector telescopes will benefit from the robust NEQ6 model, or the updated Sky-Watcher EQ6-R Pro. With the added payload capacity comes a higher price tag. If you are on a tight budget, it is worth comparing these models to see which mount is the right fit for your imaging gear. Don’t forget to account for the weight of your primary imaging camera, guide scope, and all other accessories. With the added stability of the NEQ6 comes an added overall weight. If the portability of your telescope equipment is a big concern, the more lightweight HEQ5 version may be the mount for you. The difference in overall weight between the two mounts is about 10 kg (22 lbs), including both counter weights. A mount that is surely going to get compared to the Sky-Watcher HEQ5 is the Celestron AVX (Celestron Advanced VX). 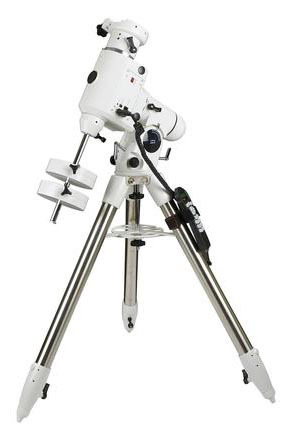 This GoTo telescope mount sits at the same price point as the Sky-Watcher HEQ5, but is much newer. The AVX is the replacement for the old Advanced Series CG-5 that I used extensively before purchasing a used HEQ5 Pro. One difference you may experience between these mounts is the polar axis finder scope. Celestron has an “all star polar alignment” feature that Sky-Watcher does not use. I believe that the polar alignment scope is an additional accessory for the AVX because of this. You don’t actually need one to polar align the AVX. Learning how to properly polar align the HEQ5 Pro using the built-in polar alignment scope took a bit of time, but now it’s a 30-second process. I have not tested the tracking accuracy of the AVX out of the box (without modifications or autoguiding). I have seen many fantastic deep sky images captured using the AVX, but I know that others have had some issues with tracking performance. I believe many of these issues can be dealt with by properly banacing the imaging payload. 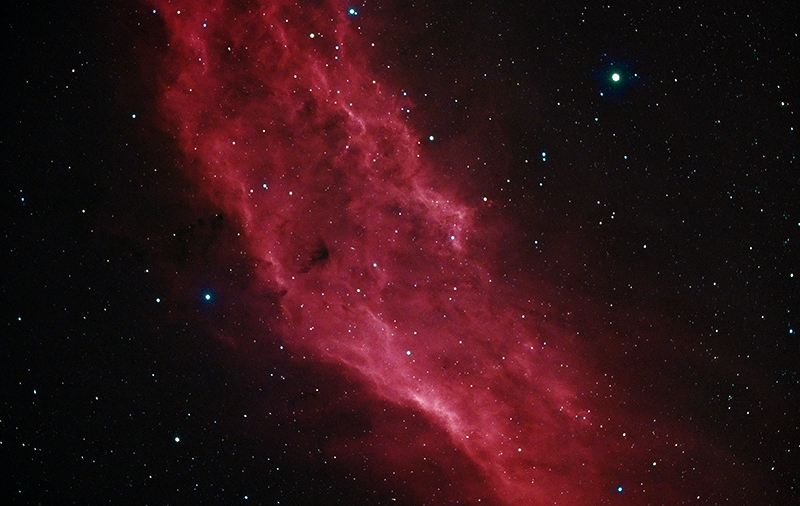 The Sky-Watcher HEQ5 is a very capable astrophotography mount with all of the features of the larger NEQ6. A wise investment due to its proven reliability and affordability. The payload capacity of 13.7 kg (30 lbs) may limit your use depending on your current imaging equipment. The NEQ6 is a sophisticated mount for many astrophotography configurations. The added stability means more effortless tracking abilities and room to expand on your imaging equipment. This mount is more expensive than the HEQ5.